Three weeks ago, I took my first trip to the Pacific Northwest. When my husband and I booked a cruise to Alaska with a few friends back in January I thought I would have all year to come up with the perfect packing list. But when the time came to actually pack, I found myself with an empty list and an empty suitcase. When I Googled “what to pack for a cruise to Alaska” I got general answers like “lots of layers” and “rain gear” but none of the advice I found went deeper. In the end, I packed my suitcase with a lot of the same clothing I use to go camping in, as well as a few other key pieces I hoped would be useful. After our trip, I wanted to edit down my experience to the ten essential things to pack on a trip to Alaska. What they say about Alaska weather is true: it ranges anywhere from bright and sunny, to frigid and gusty, to down-pouring rain in a single day. It is important to pack lots of different layers and rain gear to weather the elements. Generally tourists visit Alaska in summer but do not expect warm weather! Especially if you plan on visiting one of the many glaciers of Alaska where temperatures drop, winds gust around and sleeting rain and/or blinding sunshine are the norm. 1. A warm scarf, like this plaid Aquascutum one. A no-brainer, scarves keep chills at bay but can be easily stored and packed away in nicer weather. Throw one of these in your suitcase, you’ll be glad you did! Other options: Tissue Weight Wool & Cashmere Wrap, Tory Burch Printed Damask Scarf, or Nordstrom Plaid Scarf . 2. 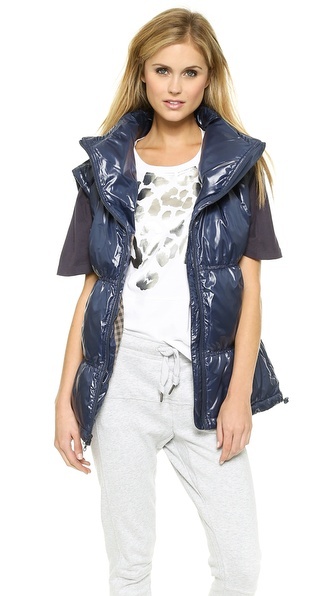 A puffer vest or waistcoat. Another essential piece for layering, a puffer vest can be worn over a sweater on cool but not chilly days and doubles as a thick coat-liner for visits to the frigid glaciers. 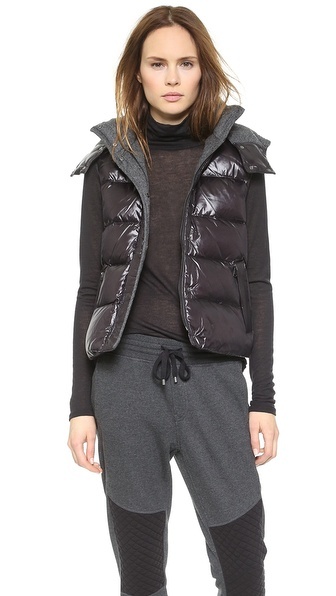 Other options: Michael Kors Quilted Down Vest, Vince Puffer Vest, or Adidas by Stella McCartney Gilet Vest. 3. An umbrella. Even though most cruise lines will provide you with umbrellas to use on excursions, I like to pack a sturdy yet compact umbrella that I can hook to the inside of my coat or throw in my purse. Believe me — in Alaska you will get caught in the rain, so be prepared! Other options: Brooks Brothers Plaid Mini Umbrella, Burberry London Compact Umbrella, or PLEMO Raindrops Automatic Folding Travel Umbrella. 4. 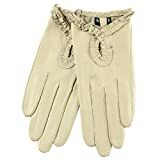 Gloves. 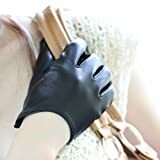 Since we travelled to Alaska at the beginning of September, I brought my more stylish Warmen Classic Lady’s Finger Half Leather Backless Gloves; but if you are going during colder months, pack thick gloves so your fingers stay warm while you take photos in frigid climates. 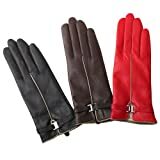 Warmen make my favorites since they are inexpensive and come in a variety of styles like Nappa Leather Wrist Driving Unlined Gloves and Luxury Handsewn Nappa Leather Winter Super Warm Gloves . 5. A sweat layer. It isn’t the most romantic wardrobe item but it is one of my little travel secrets. 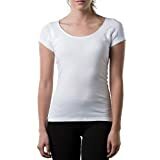 I bring three of Thompson Tee Hydro-Shield Women’s Scoopneck Undershirt sweat-blocking shirts and layer them under everything. They keep my other clothing items clean longer (and smelling fresh) and they allow me to travel with far less clothing! 6. Wellies. Hunter makes the best! When I was first packing for our trip I wasn’t sure whether to sacrifice half of my carry-on space for these boots but thankfully, I did. I wore these almost everyday! They keep you warm and dry in a downpour and have excellent traction (for say, stepping out onto the pontoon of a floatplane in the Misty Fjords National Monument). 7. A Chambray Button-Down. Though you may not technically be in Canada, the Canadian tuxedo reigns in Alaska too. Chambray shirts are durable, versatile and can be layered into almost any outfit. 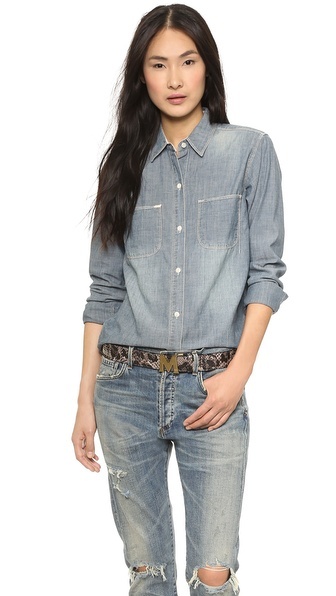 Other options include Madewell The New Wash Chambray Shirt & Halogen Long Sleeve Chambray Shirt. 8. Your best available camera. Alaska is known for its rugged beauty, abundant wildlife, and pristine wilderness. Be sure to bring your best equipment to capture this incredible state in all its glory! 9. Field Jacket. Find one with a water-resistant coating and lots of pockets. Many flight excursions (both in helicopters and in floatplanes) prohibit you from bringing even a small purse, so having a jacket with pockets allows you to pack all the essentials with you — whatever adventure you choose. My favorite options are kensie Soft Shell Field Jacket, Michael Kors Two-Tone Waxed Cotton Field Jacket, and Barbour ‘Convoy’ Utility Coat. 10. Sunglasses. Much of our trip to Alaska was foggy, misty, and rainy but sunglasses are always good to have on-hand. If you plan on visiting a glacier, they are an essential: if the sun is out, you won’t be blinded by all the white glacial ice! This Ray-Ban Unisex Wayfarer Sunglasses pair folds down small enough to fit in your pocket.